mashed potatoes until Wednesday and we loved every bite! directions, and you guys just took care of everything. you. You guys were a big part of our wedding and you were outstanding. If we ever do anything else big, you guys are the only ones we'll call. I just wanted to say thank you for all the wonderful things you did for us yesterday! Everyone is still raving about the food. I would have been happy sitting in front of the buffet table! wait to have another party for you to cater! I can't tell you all enough what great food we had for our wedding! You guys are the best and you absolutely MADE our wedding a great time. We all still talk about the food. We ate it all night long and there wasn't much left. The next morning, there was a BBQ handprint on the table cloth...some poor soul searching in the sauce for one more piece! The running joke now in our family is who can get ahold of your catering schedule so we can crash your events and eat the food! Thanks a million for everything. You are both so nice & we so appreciate how you just came in and took care of everything. You are awsome & have our highest recommendations. Please allow me to highly commend you and your staff for shwing us concern & help. Your efforts produced a very successful event. We appreciate your hard work and dedication ensuring that our company's 30th year Anniversary celebration ran smoothly. Thanks again! My sisters and I want to thank you for the wonderful job you did on our Mother's birthday party. The buffet was beautiful and the food was hot & delicious. We received many compliments from the guests about how good the food was. The manager of the community building said that the clean-up was perfect. I hope you get a lot of bookings from our party. Thanks again for a job well done! We want to thank you for everything you did for us on our special day. Your finishing touches made everything perfect. We really don't know what we would have done without you. Thank you & God Bless! I just wanted to drop you a note to express our total satisfaction that you and your staff did during our picnic last night. Everybody I talked to indicated the food and service were excellent. Your efforts happen to parallel the Rotery Motto of "service above self". I would be happy to reccomend our services to any prospective customer. 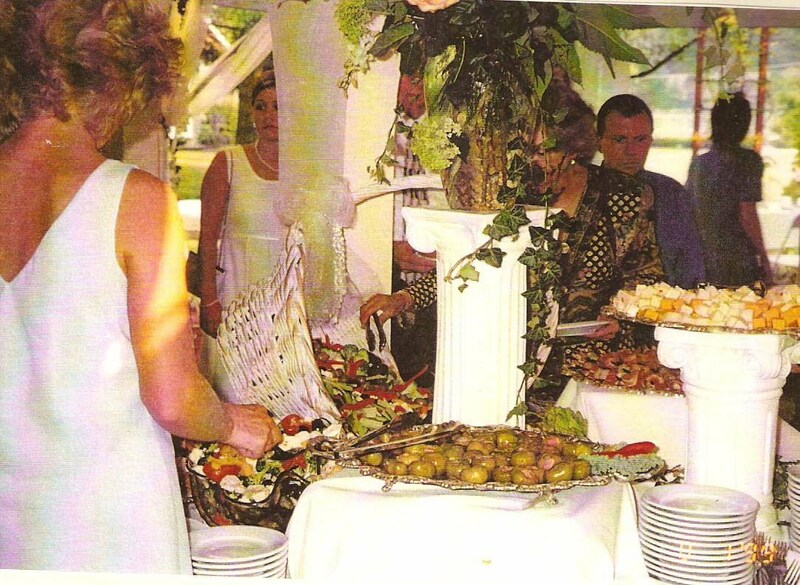 I wanted to thank you again for making our rehearsal dinner at Prickett's Fort such a success. Everything was beautifully done and the food was superb! It was unbelievable what you accomplished with that barn. We wish you continued success in your catering business. Thanks again for all of your valuable help. You were quite a pleasure to work with. We would like to take this opportunity to compliment you for a job well done on the catering that you provided for our company picnic at Camp Muffly. You made our job very easy & made us very popular because everyone attending was quite impressed and pleased with the picnic. Our entire staff would like to offer you many "kudos" for your performance. We found all of the food to be delicious, but your ribs were the biggest hit of the evening. We heard the statement "nothing beats good BBQ" several times throughout the evening. Please pass our compliments along to the chef and all staff which helped prepare our food. To say that everything was delicious would be an understatement. We were also very pleased with te amount of food that you provided. We definitely received our money's worth. We also appreciate your assistance in planning the event. Your suggestions really helped us stay within our budget. Our entire office would like to offer our gratitude to you and your staff for making this company picnic an event to remember. We will be sure to pass on the compliments to all of our friends, family, and business associates. You can also be sure that we will be keeping you in mind for future personal and business functions. Thanks again!